Panoramic views - 4 master bedrooms, main house with suites in guest house. Beautiful and private beachfront home, spacious with 4 bedrooms, 4 bathrooms, and stunning panoramic views overlooking the Sea of Cortez. Private 3/4 acre, gated and located 39 miles north of the Los Cabos International Airport. It includes expansive garden and beachfront patios, tropical landscaping and beachside palapa. Beach access is by stairs, it is very beautiful, clean and safe for swimming and snorkeling. Casa Grande is nicely furnished with a spacious air conditioned living room, sea view dining room, garden room, and more great sea views from the well equipped kitchen. Casa Grande also includes all linens, refillable water bottles and house phone. Casa Grande is air conditioned, including the bedrooms, and each bedroom has it's own private bathroom. Maid service is included a minimum of twice weekly. Rates vary depending on number in your party, we can sleep 2-8 with: 2 king size beds, 1 queen, and 2 twins. We reply to EVERY inquiry! We provide free WiFi and DSL internet, HD TV with Satellite SKY TV (English ch's. include CNN, FOX, Nat Geo, Discovery, History, CineMovies) and DVD player. Our separate casita La Quinta, at the top of the property, can be included for an additional $85 per night, includes 2 bedrooms, 1 bath. The East Cape of Baja is famous for world class inshore and offshore game fishing. Rent a pole or bring your own, catch dinner from the beach or kayak. Buena Vista and Los Barriles also offer cultural and sporting activities throughout the year, celebrating 'Buena Vista Days' the last weekend of June with live music and festivities at the town center. East Cape Arts also has an April art show and fall music festival, check online for other fun activities scheduled throughout the year. It is an easy walk through the neighborhood to restaurants, tacos, groceries, beer and town center, it's all close by. Well stocked Tienda Popular Buena Vista has snacks, sodas, beer, dairy, produce, meat, tortillas, bread and more. 2 miles from us are Chapitos and Tienda Popular in Los Barriles offer excellent selections of groceries, meats and produce. The regional mango and cajeta sweet empanadas and pan dulces are addicting with morning coffee. Over the years our wonderful guests have shared their amazing stories with us about the magic of our home and staff and wonderful experiences. Most of our guests have come to us by referral, and many return year after year. 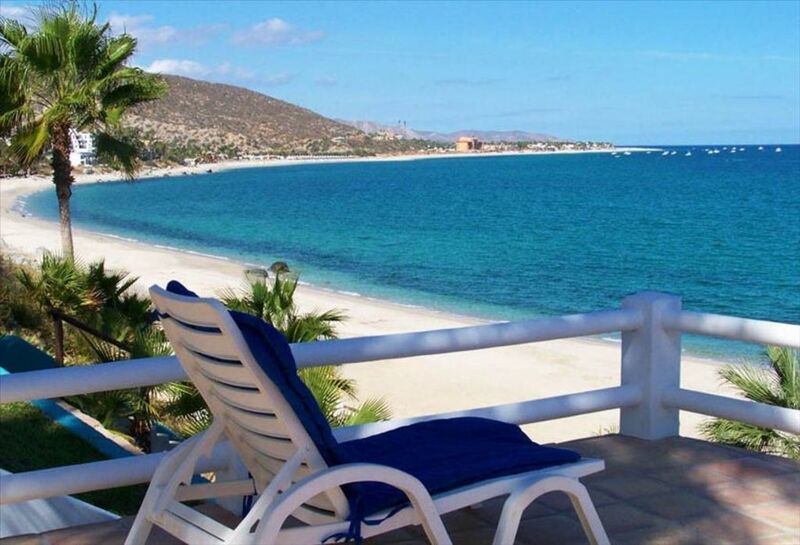 We have excellent references and are happy to answer any questions you may have about our home or area of Baja. Floor plans available upon request! Thank you to everyone for coming down, we appreciate your visits! We were charmed by the friendly local community, beautiful countryside, great food, and warm winters, the magic of the Sea of Cortez is irresistible. Through out the year, Buena Vista offers cultural and community activities to enjoy, including art shows, music, plays, and sporting events such as the East Cape Bisbee fishing tournament and Baja offroad races. There is always something to do and great places to explore in our area of the Baja peninsula! Fantastic sun rises over the Sea of Cortez! Outstanding turtle hatchings right on our beach, with whale and wildlife watching right from our decks! Great whale and wildlife viewing. Satellite TV with several English options. Adult and child’s fins, snorkels and masks. Kayaks, snorkel gear, books, games, beach chairs, out door shower and more! Maid included a minimum of twice weekly. This home is situated on a beautiful spot on the Sea of Cortez. This home is ideal for a large family trip. We just spent Thanksgiving at this beautiful home. There were 8 adults and plenty of space. Fantastic setting right on the Sea of Cortez. Only a couple of minutes by car to Los Barriles. Everything restaurant in town was excellent. We had a wonderful time. Awesome property, exactly as advertised. 3 buddies and I rented the property for 5 nights. We fished 4 days. We called the property the "Mtv crib". Really nice property on a bluff overlooking the sea. It was fantastic to sit outside on the patio at night looking up at the amazing stars. The AC worked perfectly. After fishing all day, it was great to have the satellite TV to watch the evening football and baseball games. The kitchen could use some sharp knives, but the main refrigerator looks darn near brand new and their is also another one, which we found useful to keep adult beverages cold. As an added bonus the housekeeper came by not once, but twice, and even did our laundry, It was really nice to come back exhausted from fishing to a neat and tidy house with the laundry done. I was in contact with the owner and she was very responsive and helpful. I needed to charter a boat and she referred me to Nic at losbarrilessportfishing dot com. I really appreciated that referral as Nic and his captain were also responsive, helpful, and hard working. The boat even picked us up and dropped us off from the beach right in front of the house. No need to drive every morning. The house is in a quiet, peaceful location. There is not much within walking distance, but we were too tired anyway from fishing all day and we had a van. If I come back to this area, I will definitely consider this rental again. Thank you so much Andrew! We enjoyed having you and yes, we’ll be sure to resupply Casa Grande with some sharp knives ASAP. We appreciate the info. Hope to see you again soon! Great property all you need for a perfect family vacations. I traveled with seven members of my family and spent three nights. there was everything needed to cook, have fun and be comfortable. We stayed for 8 days with a large family and we had plenty of room to spread out between the house and casita. We loved having a private gate to the property and when we walked in to the house the view took our breath away. Awesome beach access, with private palapa, kayaks, snorkel gear, etc. This place is fully equipped! Kitchen was fully stocked with everything you will need. All of the surrounding hotels allow you to use their facilities so pool access was no problem and we enjoyed going North and South visiting several different spots. Far more than we expected. The house was great, location perfect. AC kept the house the perfect temp. Kayaks and snorkel gear were used daily and I already miss it. We have explored Mexico many times - never Baja - now we are "sold" on the experience. This property exceeded our expectations. Everything was "as advertised". I read many of the other reviews and they are all correct. If you want to really experience Baja - stay here. If you want more of the USA - stay in Cabo San Lucas. Buena Vista and surrounding areas are a slice of paradise. Great community, fun, safe, great food and shopping.